Writing a brief history of cyberconflict of the last decade and speculating on the future of warfare is by no means an easy task. The reasons are plenty and it is worth mentioning a few here, as they do tend to get lost in colleagues’ specialised debates in the fields of international relations and global politics, global and national security, internet security, new media political communication, international governance, internet governance, information warfare, critical security and the geopolitics of new technologies. Information communication technologies (ICTs) have unsettled in an unprecedented way the majority of academic fields, all of which are currently required to negotiate multi-level conflicts transferring from the real world to cyberspace or being created originally through cyberspace and spilling over to real life. Equally, as correctly pointed out by one of the reviewers of this chapter, this is a very fast-moving field. It is also a field, which is not solely dominated by states and traditional wars, but by movements, civil society organizations, protest events, insurgencies, network resistances, and ad hoc assemblages. 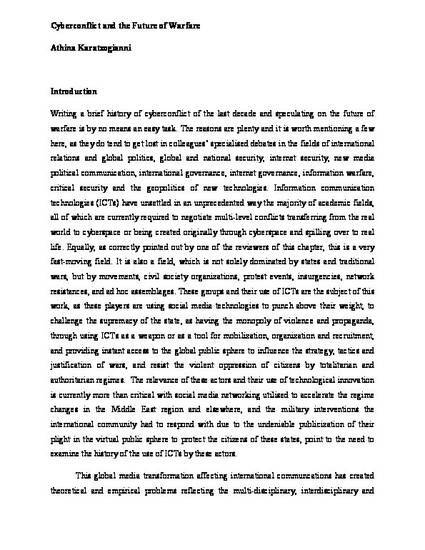 These groups and their use of ICTs are the subject of this work, as these players are using social media technologies to punch above their weight, to challenge the supremacy of the state, as having the monopoly of violence and propaganda, through using ICTs as a weapon or as a tool for mobilization, organization and recruitment, and providing instant access to the global public sphere to influence the strategy, tactics and justification of wars, and resist the violent oppression of citizens by totalitarian and authoritarian regimes. The relevance of these actors and their use of technological innovation is currently more than critical with social media networking utilised to accelerate the regime changes in the Middle East region and elsewhere, and the military interventions the international community had to respond with due to the undeniable publicization of their plight in the virtual public sphere to protect the citizens of these states, point to the need to examine the history of the use of ICTs by these actors.